On Friday, 10 August 2018, civilian ‘Ouda Ibrahim Hasan al-Sa’idy (24) was killed after being hit with a live bullet to the head while he was near his house in ‘Arab al-Jahalin Bedouin Community, near al-Nar Valley intersection in al-Izzariyah village, east of East Jerusalem, during a security campaign that was launched by Palestinian security services against illegal petrol stations in the village. The Palestinian Center for Human Rights (PCHR) expresses its deep concern over the incident and calls for calls for opening a serious investigation into the incident, publishing the results and taking necessary legal action. According to PCHR’s investigations and eyewitnesses’ statement, at approximately 20:30 on Thursday, 09 August 2018, a patrol of the Palestinian Customs Department headed to Dalia Petrol Station, which is near al-Izzariyah eastern entrance, after they received information that a smuggled fuel tank arrived adjacent to the petrol station. While the Palestinian patrol was in the petrol station, unknown persons opened fire at them. After that, more security patrols arrived at the petrol station, where a heavy clashes erupted between the security services and the anonymous gunmen. During which, the security officers damaged the contents of the abovementioned petrol station. On the next day dawn, the Palestinian Customs Department’s officers along with security national officers moved into another illegal petrol station, which is about 500 meters away from the former station, in ‘Arab al-Jahalin Bedouin Community, near al-Nar Valley intersection. The petrol station is owned by one of the community residents. The national security officers moved into the Bedouin Community, raided and searched a number of houses, attacked the inhabitants, and fired live bullets at the area. As a result, ‘Ouda Ibrahim al-Jahalin (24) was hit with a live bullet to the head while he was in front of his house. ‘Ouda was transferred to Hadassah Medical Center in Western Jerusalem, where his death was declared a few hours later. Dawoud Jahalin, Head of ‘Arab al-Jahalin Community Council, said to PCHR’s fieldworker that ‘Ouda was grazing his livestock few kilometers away from the area. When he heard the sound of gunfire, he returned home. As soon as ‘Ouda arrived at the area, he was directly shot and wounded to the head. Jahalin also said: “I carried ‘Ouda and took him to the intersection of “Ma’ale Adumim” settlement. ‘Ouda was then taken to to Hadassah Hospital in Jerusalem, where his death was immediately announced”. In contrast, the media quoted an “official security source” as saying that the security force was exposed to gunfire, forcing it to fire several warning shots and retreat back. A heavy gunfire was opened towards it again, so the security force responded to the source of gunfire in accordance with the rules of engagement and self-defense. 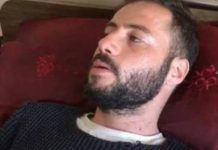 After that, the Palestinian security forces were informed that there was a civilian sustained serious wounds namely ‘Ouda Ibrahim Hasan al-Sa’idy (24). ‘Ouda was taken to Hadassah Hospital, where his death was later announced. A security official added that immediate instructions were issued to form an investigation committee in order to find out the incident’s circumstances and submit its recommendations to the authorities to take necessary measures according to the law. Following the announcement of Jahalin’s death, the residents of the Jahalin Bedouin Community closed with stones and tires Wadi al-Nar road in al-‘Izariya village, which links between the north and center of the West Bank, protesting against the killing of ‘Odah. It should be noted that tension continued in the village. On Friday afternoon, the Palestinian security forces attempted to open Wadi al-Nar road by force and fired a barrage of live bullets at the area. PCHR highlights the absence of ambulances in scene of the security operation according to the eyewitnesses, is considered a serious indication of neglecting the safety measures by security services. Additionally, it constitutes a clear failure of those responsible for the operation and therefore requires holding them accountable. PCHR affirms the right of the authorities to impose the law and prosecute violators and outlaws. Moreover, PCHR stresses the importance of security forces to be committed to the shooting standards that oblige security officers to use firearm only in the cases of self-defense or imminent danger according to the principle of disproportionality stipulated in the international standards. PCHR expresses its deep concern over the recurrence of such incidents and calls for opening a serious investigation into the incident, publishing the results and taking necessary legal action.